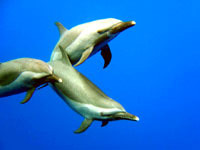 Dolphins are amazingly intelligent and being with them in their natural habitat is an experience that is uniquely Hawaiian. 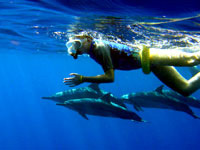 Join us for our Big Island Dolphin Swim Snorkeling Excursion and experience first hand how curious, gentle and inquisitive dolphins can be. 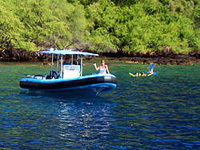 Your adventure begins with a cruise along the beautiful Kona shoreline where you can take in the intense colors and scenery of Hawaii's Golden Coast. This area is known for beautiful, calm and clear cobalt blue waters and the lush tropical vegetation dotting the coastline. 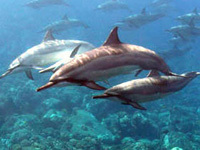 The majority of the Dolphins you will be interacting with are Spinner Dolphins which are always off of the Kona Coast remaining in these waters year round. Dolphins are very active and playful in the morning and on our morning Dolphin Swim, you will get to experience the dolphins coming together to interact and have fun. Our Dolphin Swim encounter as been operating as an eco-friendly tour for over a decade averaging a 98% success rate in locating our local Spinner Dolphin pods. 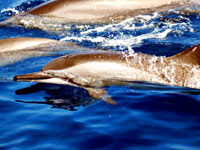 Equally important is the context within which the tour is offered which is a philosophy of total respect for the Dolphins, all marine life and the ocean.